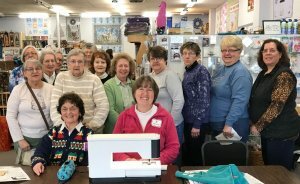 Our PFAFF Club is made up of PFAFF machine owners who meet monthly for a lecture/demonstration of techniques, projects, accessories or other information in the continuation of their learning all aspects and capabilities of their incredible PFAFF Sewing, Quilting, and Embroidery machines. Here are the directions for the Danish Star Ornament shown at our December 2018 meeting. January 8 or 15 Needle Knowledge and Best Practices Get the Sewing Machine Needle Caddy directions here. See how a sewing machine needle is made. December 17 (Both Groups at 7 pm) Holiday Party!